LAS VEGAS, NV – Sometimes, one M.2 PCIe drive is not enough. Some motherboards come with three M.2 slots for NVMe SSDs, but that might not be enough either. To get more, users need add-in cards, and these typically come in single, dual, or quad arrangements. Actually, there’s currently only one company that offers a consumer-focused quad M.2 card. Now ASRock is joining the market. There is nothing too complex on an M.2 PCIe add-in card: the PCIe lanes on the slot finger go directly to the drives in question. As long as there is sufficient power, and sufficient cooling, there is not much more to it than that. 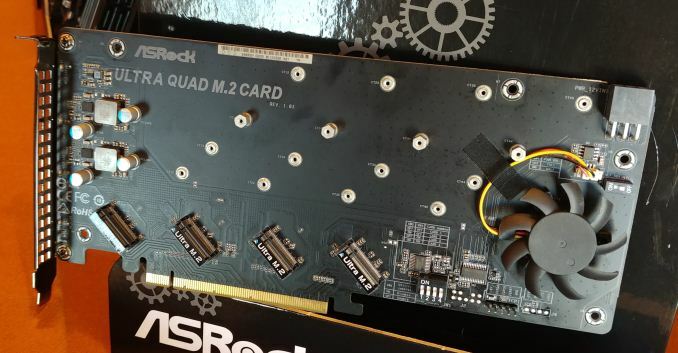 ASRock’s card positions the M.2 drives at a 45-degree angle, provides a PCIe 6-pin for power, uses its metallic shroud for additional heatsink cooling, and then puts in a fan to direct airflow out of the exhaust. This is a variable speed fan that reacts to a thermal sensor, so will speed up if the case is warm. If you wanted overkill M.2 cooling, this is it. There is another feature that ASRock has had to put on the card, for anyone that wants to put more than one of these Ultra Quad M.2 PCIe Cards into the system. 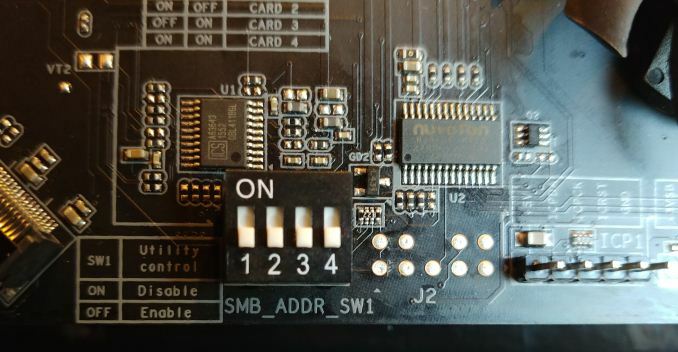 A series of four DIP switches are on the PCB which enables ASRock’s software and the system to determine which is the first Quad M.2 PCIe card, which is the second, and so on. Otherwise enumeration of drives in certain situations might not be guaranteed. ASRock lists the add-in card as having support for Intel’s VROC technology, although that requires Intel PCIe SSDs in order to function as well as the VROC module. 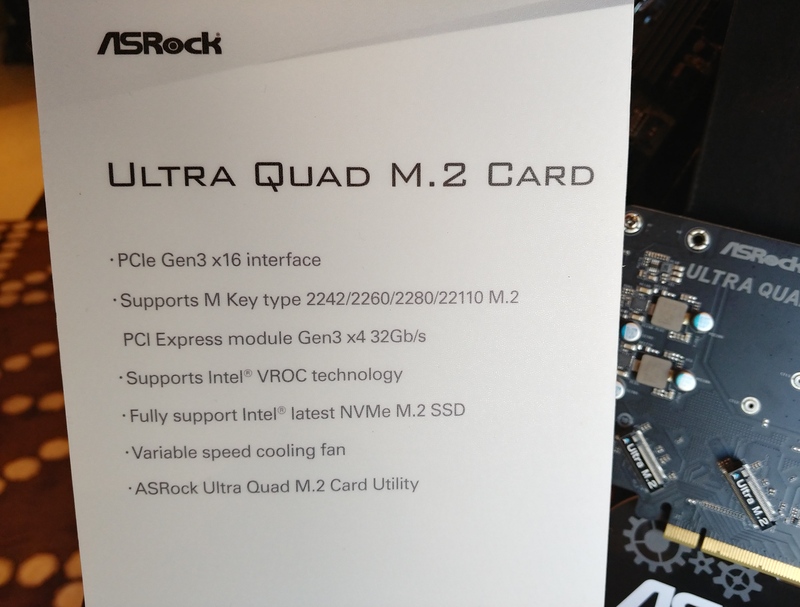 ASRock also stated that these cards support AMD systems without any similar requirements. 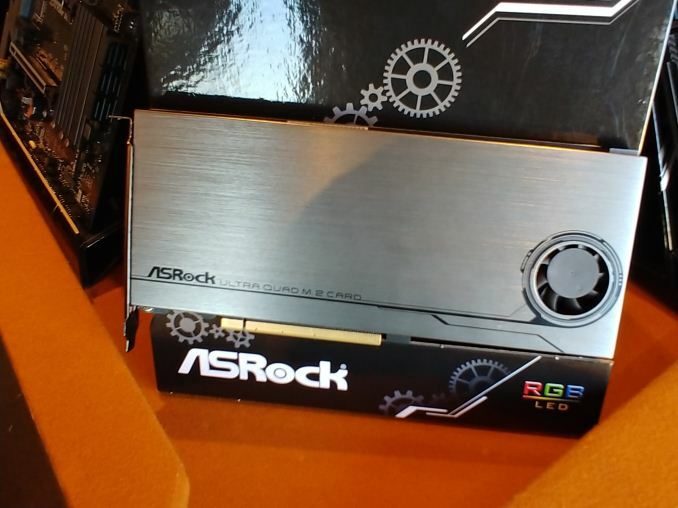 We suspect that ASRock will release the card sometime within Q1. Price is still to be determined. Does this have specific requirements of the system to work? I thought certain chipsets explicitly do *not* allow splitting the CPU PCIe lanes to multiple devices. That's why B250 boards (for example) cannot split the 16 CPU PCIe lanes to multiple graphics cards. Isn't this similar? Or is there a PCIe switch on the board? Would that have a tangible latency impact? EDIT: "(of which are are now many)" should be "(of which there are now many)"